1. Hide all the animated geometries (if it is fly-through animation without moving objects skip this step). 2. Use "Irradiance map" and "Light cache or Brute force" (depending on the case) for primary and secondary bounces. 3. Activate the "Use camera path" option for both (if BF is the secondary bounce engine leave it with the default settings and activate the option only for the IM). Also I will recommend using high settings for the IM since you will calculate it only once. The same goes for the light cache. 4. Render the image out and save the IM on the hard-drive. You can set it to auto save if you decide to and not render the final image. It will work the same way after that. 5. Set the IM to "From file" mode and load the file. Set the secondary bounce engine to none. At the moment you have GI precalculated for the whole camera path (except for the hidden objects) and if you are doing fly-through animations this will be the last step. 6. Unhide the moving object and in its material turn off the option called "Use irradiance map" (In the Options section). Now, the moving object will appear dark if rendered because only one "brute force GI" bounce is calculated. Its subdivisions are controlled by the subdivisions of the IM (otherwise useless, since we are using IM from file!). This means that if the IM subdivs are set to "50", you are doing one bounce of light only for the torus with 50 hemispheric subdivisions (brute force subdivs). 1. Set secondary bounces to "Brute force" and only for the torus V-Ray will calculate BF-BF GI (which tends to be slow but accurate). In an interior you will have to up the "secondary bounces" of the brute force. 2. You can set the secondary bounces to "Light cache". Turn off "use camera path" (this is optional, you can leave it on). This way the LC will be recalculated for each frame for the whole image but will be used only for the object that is moving (as secondary bounce information while the first bounce is still BF). This is quite a fast method and I tend to use it a lot. It is also the most accurate one because of all the bounces that the LC can make. It's a good one... On Wednesday 4th July, we've got three great presentations lined up. 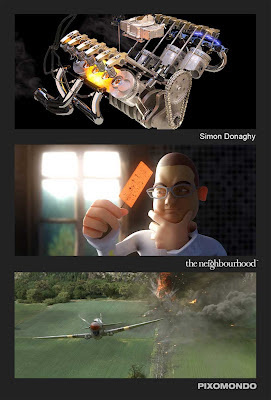 Last month Simon Donaghy showed me a very cool animation, so to start the evening he's kindly agreed to talk a little about the plug-ins he used, FumeFX, Krakatoa, Thinking Particles etc and how he went about rigging the animation. Check out Simon's site, there are some great resources on there. The Neighbourhood are back, as promised a couple of months ago! They will be showcasing their 'Like a Kid in a Sweetshop' project for Heston Blumenthal. Creative Director Jon Humphreys will be discussing the creative development of the project and 3D artist Stuart Dearnaley will be sharing some behind the scenes technical knowledge. Again, check out their site to whet your appetite. I'm also happy to tell you Pixomondo are coming along to tell everyone about their London studio, and show us how they used 3ds Max for some of the visual effects in Red Tails, just one of the fantastic projects they've been involved with this last year.